The downside of book contracts comes when you lose control of your self. And that’s the case now that my name is attached to two “new” Dummies books that I had no direct involvement in writing … and didn’t even know existed until I read about them in a blog. Let me say upfront this doesn’t mean they’re not good books. But my advice and image — state of the art nearly a decade ago — have been repackaged and represented as current. It’s marketing at its most automatic. Background: In 2000, Bud Smith and I wrote Internet Marketing for Dummies, a successor to 1998’s Marketing Online for Dummies. The contract I signed allowed for non-U.S. editions, a good idea. IMFD was translated into languages and alphabets I don’t read, or in some cases, recognize. All in all, IMFD was in print for seven years, a good run. 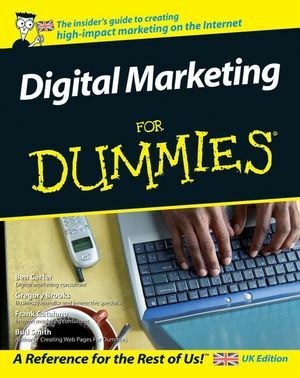 But last year, I noticed blog posts referencing Frank Catalano’s book, Digital Marketing for Dummies. I discovered that Wiley had published a U.K. Dummies volume under that name and with two new co-authors. A bit more research found a second U.K. volume, this one a compilation, Starting & Running a Business All-in-One for Dummies, in which I was one of a veritable writers’ workshop of authors. What happens in the U.K. stays in the U.K., right? Not in this age of Internet marketing. Amazon offers an “import” version of Digital Marketing for Dummies by Ben Carter, Gregory Brooks, Bud Smith and Frank Catalano. Amazon also offers the Kindle version of the U.K. edition of Starting and Running a Business All-in-One for Dummies (without, I might add, obviously stating it’s the U.K. version). Amazon’s Search Inside feature confirmed my passive participation, my agent was kind enough to request copies of each for me after I found out, and Wiley was kind enough to provide them. While my id is delighted that my hard work lives on and my name is still out there, my super-ego is quietly horrified that a “new” book lists, on the cover, “Frank Catalano is an Internet marketing consultant” (how, well, 1990s). On the other hand, Carter and Brooks have retained most of the strategy and relevant tactical advice (adding lots of U.K.-friendly spellings and well-organised new information). Dan Matthews’ Starting & Running a Business compilation does the same. Yet my bio has been encased in amber. My advice? If you’re a writer, ask for the right to update your biography in subsequent editions so the publisher isn’t doing dated marketing. If you’re a reader, buy the book for the info, not the bio. I suspect this new found auto-authorship will have its side effects for a while. Two weeks ago, I got a call from a reporter wanting to interview the co-author of Digital Marketing for Dummies. I said I’d love to help, and promptly gave her the name of an agent who might know how to track one of them down. Ah, the difference between U.S. contracts/law and Europe’s. We have no “moral rights” in this country, but in Europe, there is such a thing and your name could not have been used like this without your permission. I find it pretty shocking–law or no–that this happened, I have to say!